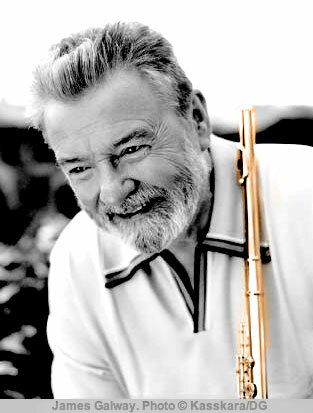 The very simpatico gentleman in the picture is Sir James Galway, Irish virtuoso of the flute. Not only has he recorded a tremendous range of music (selling over 30 million albums to date) but he works to adapt other music to the flute, encourages composers to write for it, holds Master classes, publishes books on flute playing, and is President of Flutewise, a UK ONG “dedicated to helping all young flute players flourish, getting the most from their instrument and music”. And what’s more, he’s a fun person. James Galway was born in Belfast, Northern Ireland, in 1939. Little “Jimmy”, as his friends knew him, was raised in a musical household, with his mother playing the piano and both his father and grandfather playing the flute. At the age of ten, he was the winner of all three age classes of the Irish Flute Championships. By the time he was in secondary school, he was completely immersed in music, and at 14 he moved to London to continue his studies at the Royal College of Music and the Guildhall School, followed by the Paris Conservatory. He began his career at the Sadlers Wells Opera and the Royal Opera Covent Garden (he would play gigs and occasionally busk on tube stations to earn extra money!) and this led to positions with the BBC Symphony Orchestra where he played piccolo, and the London Symphony Orchestra and the Royal Philharmonic Orchestra where he was Principal Flute. There is an oft-recounted story about Galway’s auditioning in 1969 for the post of first flute with the Berlin Philharmonic, then the most prestigious orchestra in Europe, under von Karajan – who expected absolute devotion and discipline. Due to confusion about times, when Galway turned up at what he understood to be the appointed time for the audition, he was told the position was already filled. With typical Irish brio, Galway insisted that, having come so far, he should at least be given a hearing – and after much discussion, he was asked onto a stage, facing a darkened auditorium, and told to play. After his first piece, a voice from the darkness asked him to play another, then another, with which he complied, playing all from memory. Then they called him for a second round later that same day, when he found himself sharing the stage with four other flutists. They were asked to play in turn the same piece. As before, Galway was the only one to play from memory. Within half an hour the jury had reached its verdict, and he was informed: “Congratulations, Mr. Galway. You are now the principal flautist with the Berliner Philharmonic. When can you start?” Galway was taken aback, and so he replied quite coolly: “Listen here, I don’t know that I can start at all. I mean, I’m not sure that I want to start. You’ve done nothing but tell me off. Why should I leave all my nice colleagues in the Royal Philharmonic Orchestra in order to come to Berlin?” The people from the orchestra could not believe their own ears: “But Mr. Galway,” they stuttered, “when you’re offered a job in a German orchestra, you have to take it.” But the flutist just packed his bags and flew back to London. He had barely got home when the telephone rang. The Philharmonic explained that he had been unanimously chosen by all the musicians and that this was an honour. They begged him to reconsider…… and so he returned, and stayed for six years as Principal Flute. But in 1975 he took the courageous step of launching a career as a soloist, playing and recording with different orchestras. In the first year he made 4 LPs and played 120 concerts! But his success was tremendous – and he became one of the world’s leading recording and concert artists. But it has not always been easy – he has had to recover from serious accidents at some stages of his career, and his happy marriage to Jeanne in 1984 was his fourth go at a long-lasting relationship. In 1979 he received the OBE, and in 2001 he became Sir James Galway for his services to music. Today, apart from concert and recital performances, recordings, and appearances on television, he holds Master Classes, where he both instructs and entertains. On his site, http://www.thegalwaynetwork.com/ there are some video clips from these – very good value, and a fascinating glimpse at the man himself. The flute is one of the most ancient of instruments. The modern concert flute, such as he plays, is held traversely, and the waves which make the sound are set up by blowing across a hole near one end. The wavelength (pitch) can be altered by opening or closing holes along the flute’s length, in various combinations. However, the octave differences are made by altering the way the air is blown across the lip – and the normal range is three octaves above middle C. The player’s “embouchure” is critical to the pitch of the notes and the tone quality. Of course, Galway is a virtuoso – lovely singing intonation, full low notes, incredible agility. Just perfect. He often draws the parallel with singing – how breathing and an open chest help the player to get a good resonance which projects the sound. But his art is maintained by an extraordinary amount of practice. As soon as he comes back from a concert tour, he spends hours a day practising scales and arpeggios, which he considers the bricks and mortar from which music is constructed. His attitude towards practice is absolutely refreshing (so far from regarding it as drudgery! )… he says ” How you practice is how you will sound….. get in a room which gives you some feedback….. and see what you can get from it on this new day”. And how about this – “I do not consider myself as having mastered the flute, but I get a real kick out of trying”. while Briccialdi’s Carnevale di Venezia is a real technical workout. I confess however, that this music, perhaps because of its gentle melodiousness, tends to send me into a daydream, or even into blissful slumbers. And so, if you need some spiritual rest, put on this CD, and…. This entry was posted on Tuesday, March 20th, 2007 at 2:29 pm	and is filed under Classical. You can follow any responses to this entry through the RSS 2.0 feed. Both comments and pings are currently closed. Gotta love google, very cool site. Thanks…. Looking for something else, but very fine site. All the best…. Entries (RSS) and Comments (RSS). 25 queries. 0.426 seconds.